Our family winegrowing cultivates 13 ha of vines on 3 communes (Dambach la Ville, Scherwiller and Châtenois). Our ancestors, coming from Switzerland, settled in Dambach la Ville at the 17th century and practiced the mixed-farming like very many Alsatian families. It is with my grandfather Joseph FREY and my Charles father that the sale out of bottle started. Nathalie and Dominique give a new commercial dash to Winegrowing FREY Charles and Dominique with the first exports in the European countries or to Japan, Canada, the United States. In 1997, we decided to pass the estate in biological culture under Ecocert control. Since 2001, we practice the biodynamy with much happiness. We try to transmit to the wine energy and the life which we give to the grapes so that this one is more digeste and most alive possible. Above all, the culture biodynamics is a work of care of the ground. It is a question of ensuring balance and of creating harmonious living conditions of it between ground, plant and environment. The various treatments of the vine are systematically accompanied by herb teas of plants (nettle, prêle, willow). The compost and the work of the ground are fundamental. The grapes are gathered manually. The grape is versed in entirety on the press without pressing nor picking off in order not to damage it. Pressing is done slowly and carefully. After fermentation, the wines are matured on lees until spring. 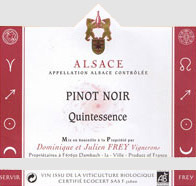 Remarkable pinot gris Quintessence 2009, with the aromas of grilled almond, yellow robe to the reflections of gold, a wine powerful and distinguished at the same time, rich with the nose as in mouth, very harmonious, all stops some like Gewurztraminer Clos Saint-Sébastien 2009, all of structure and perfumes, with notes of hazel nut and rose, a powerful, dry and supple wine at the same time, all in smoothness. Always taste their brut Crémant d’Alsace brut Plaisir Perlant Millésimé, which releases from the nuances of white flowers and honey, of a beautiful color but, a full and scented vintage, of fruity, light and round mouth at the same time, of persistent foam, really charmer. 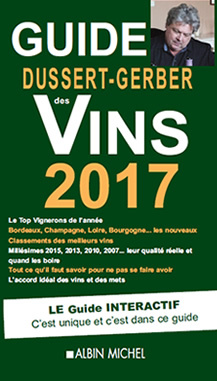 Gewurztraminer Collines de Granit 2011 is elegant, delicate and air, a fruity wine, where freshness prevails, while Riesling Vieilles Vignes 2010 is all of structure and perfumes, of very subtle mouth with almond notes, at the same time mineral and smoked.